Photo Caption: Hundreds of pumpkins will be ready and waiting for local children to decorate at Charles River Bank’s Mendon office, located at 1 Hastings Street, during the Country Fair on October 8th from 10am to 5pm. Charles River Bank is proud to once again be a corporate sponsor Mendon Lions Country Fair that is being held this year on Saturday, October 8th from 10am to 5pm at the fields of the Blessing Barn, 5 Hastings Street. The Bank’s booth on the fairgrounds will offer free Halloween themed gifts for children, candy, other gifts and free raffle prizes, as well as discount coupons for various financial services including, new accounts, safe deposit boxes and mortgage loans. Bank staff will be available all day to greet visitors and answer any questions. In addition, Charles River Bank will offer complimentary fun family activities at their Mendon Office at 1 Hastings Street, which is adjacent to the fairgrounds. On CRB’s front lawn, is a bounce house with a giant inflatable slide for children and those fun-loving adults who are kids at heart. 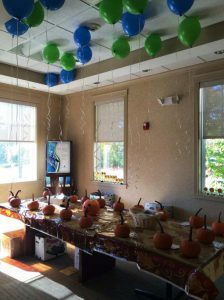 Inside the office, children can tap into their creative talents by selecting one of the hundreds of small pumpkins provided by the bank to decorate on site. The Bank will also have Halloween themed coloring & activity books, balloons, cupcakes, candy and beverages. Be sure to stop in and enjoy the FREE activities on your way into or out of the fairgrounds! “Charles River Bank has been a long-time supporter of the Mendon Lions Club and the Country Fair, which is a perennial favorite event for our town. We love the opportunity to bring these family centered activities to the local community in conjunction with the Fair. We welcome our existing customers and look forward to meeting new friends in our Mendon office and at our Fair booth!” stated Charles River Bank President & CEO Jack Hamilton. For any questions about our booth or branch activities, please call 508-533- 8661 or email info@charlesriverbank.com. 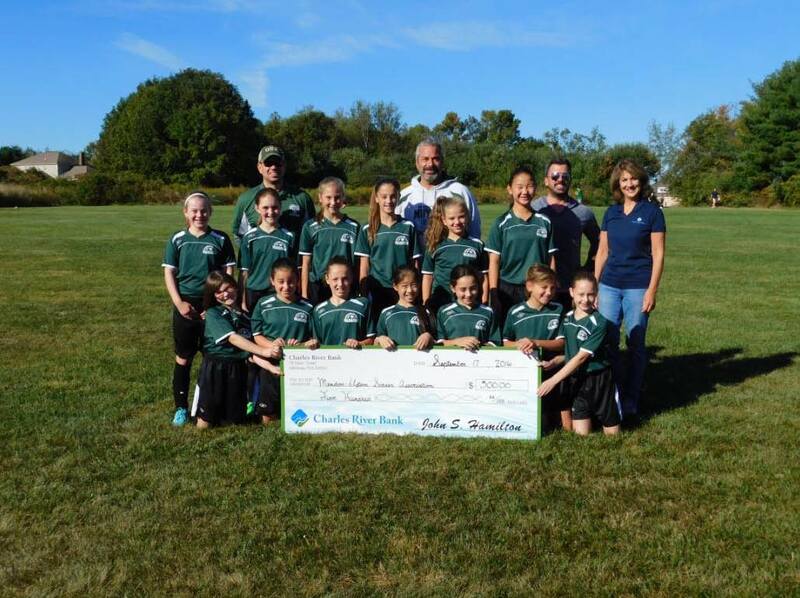 Photo Caption: (Mendon) Ann Gonyea, Charles River Bank AVP/Mendon Branch Officer , presents a donation check of $500 to Mendon-Upton Soccer Association’s Dave Kirby, Robert Cavanaugh, and Jonathan Harvey, along with members of the girls soccer team, in support of the 2016 season. Photo Caption: (Mendon) Ann Gonyea, Assistant Vice President and Mendon Branch Officer, Jack Hamilton, President and CEO, and Ann Sherry, Vice President of Customer Care and Relationship Development, pose for a picture at the newly opened Taft Public Library. 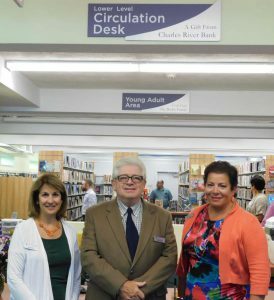 The new library’s Lower Level Circulation Desk was funded through a $2,500 contribution from Charles River Bank. On September 13, 2016, Taft Public Library held their grand re-opening in their newly constructed location at 29 North Avenue. Charles River Bank AVP/Mendon Branch Officer Ann Gonyea, President & CEO Jack Hamilton, and SVP/Customer Care & Relationship Development Ann Sherry attended the event. The bank’s financial contribution to the project helped build the library’s lower level circulation desk where visitors will be able to check out library materials. The library first opened in 1881 and has grown substantially over the past 135 years. This relocation has helped transition the library into the 21st century in order to better serve the surrounding community. Photo Caption: (Medway) Ann Sherry, Charles River Bank Senior Vice President of Customer Care and Relationship Development, presents a donation check of $1,000 to the Medway Mustang Gridiron Club represented by cheer and football captains: Sarah O’Connor, Dylan Ehrmanntraut, Patrick Travers, and Julianne Pratt in support of the 2016 season. 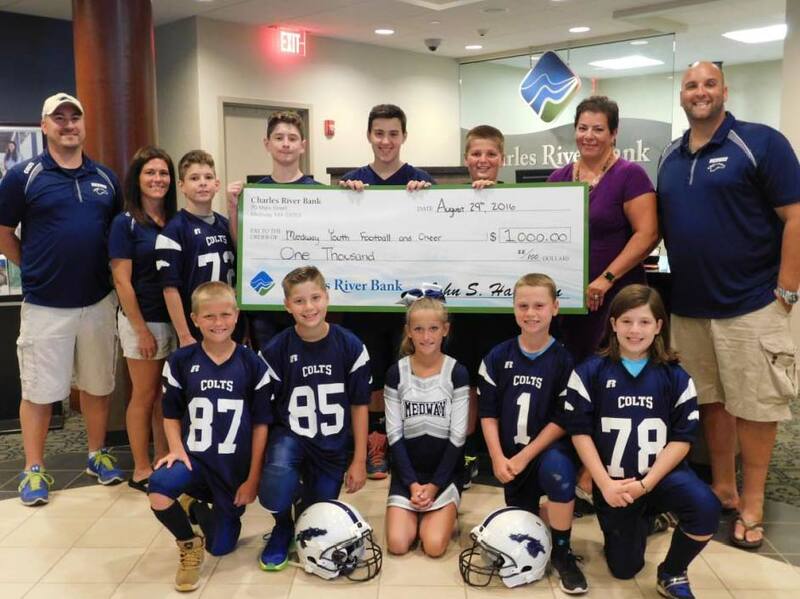 Photo Caption: (Medway) Ann Sherry, Charles River Bank Senior Vice President of Customer Care and Relationship Development, presents a donation check of $1,000 to Medway Youth Football and Cheer’s President John Farrell, Treasurer Cheryl Richardson, and Vice President Matthew Applebaum, along with members of the football and cheerleading teams, to support the 2016 season. Photo Caption: (L-R): Michael Soter (Chairman, Bellingham Board of Selectman), Ann Sherry (Sr. Vice President/Customer Care & Relationship Development, Charles River Bank), Michael Tuite (Assistant Vice President/Bellingham Branch Officer of Charles River Bank), and Denis Fraine (Bellingham Town Administrator). Every year the Town of Bellingham hosts a fun-filled 4th of July celebration and this year’s event will feature even more exciting entertainment and activities. 2016 marks Bellingham’s 20th anniversary of hosting this family oriented celebration of our nation’s Independence Day. Charles River Bank has supported the Town of Bellingham’s July 4th celebration since opening its Bellingham office. This year Charles River Bank Sr. Vice President Ann Sherry and AVP & Bellingham Branch Officer Michael Tuite presented Bellingham Board of Selectman Chairman Mike Soter and Town Administrator Denis Fraine with a donation of $1,000 to help offset some of the expenses of the fireworks and musical entertainment. “Each year this event has been funded through donations and, once again, businesses like Charles River Bank are stepping up in a big way,” stated Fraine. This year’s celebration will be held on Monday, July 4th. Free parking for this event is available at both the Bellingham Middle School and High School on Blackstone Street. At 6:30 PM there will be a concert featuring the band, Pieces of Eight, and at approximately 9:30 PM the always much anticipated fireworks show created by the Rhode Island Pyrotechnics begins. Local youth groups and school organizations will be offering refreshments and 4th of July novelties. 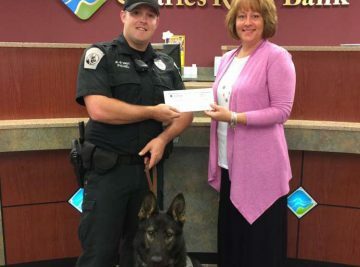 Photo Caption: Nancy Macleod, assistant manager of Charles River Bank Mendon office, presents Officer Pichel and his k-9 partner Brady with a donation check of $500 to support the Mendon K-9 program. The program began in December, 2015, and is intended to assist the police force in more effectively patrolling the town of Mendon. donation to Officer Matt Pichel, who manages the K-9 Program in Mendon, and his German Shepherd K-9 partner Brady. Photo Caption (L to R): Charles River Bank AVP/Bellingham Branch Officer Michael Tuite, Bellingham Senior Center Outreach Coordinator Sheila Ronkin, Bellingham Senior Center Assistant Director/ Outreach Lisa Mottola and Charles River Bank President & CEO Jack Hamilton with the $1000 donation to support outreach programs. 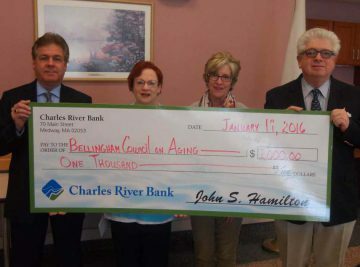 The Bank’s contribution was directed to the Bellingham Council on Aging to help fund the development of new programs that will entice seniors to be more productive and social with one another. The ultimate goal is to unite them and encourage them to rejoin Bellingham social life. The Bellingham Senior Center is located at 40 Blackstone Street, Bellingham, MA. Anyone interested in finding out more about these programs is encouraged to contact the Senior Center at (508)-657-2705. 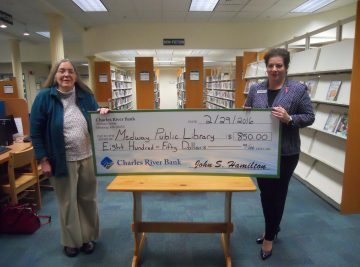 Charles River Bank is proud to make the donation of $850 to the Medway Public Library. The donation resulted from one of Charles River Bank’s 100th Anniversary Celebration programs, where the bank hung 100 wind chimes throughout the towns where its branches are located – Medway, Bellingham, and Mendon. Medway, 34 wind chimes were placed both inside local businesses and outside in public areas. The Bank made a donation totaling $850, which represents $25 per wind chime located in Medway. For 100 years, Charles River Bank has focused on serving local individuals, families and businesses. 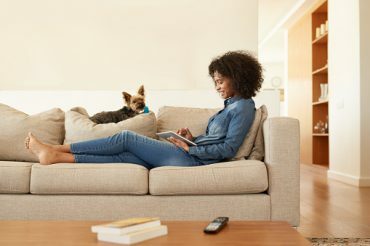 The Bank supports organizations that deliver valuable programs to the local community, especially those that benefit young people, and chose to reach out to a local organization that had similar priorities. The library was a natural choice because of the wide ranging programs they deliver to community, from children to adults. Charles River Bank President and CEO Jack Hamilton donated $825 to the Bellingham Public Library. The $825 check was presented to Bernadette Rivard, Director of Bellingham Public Library. 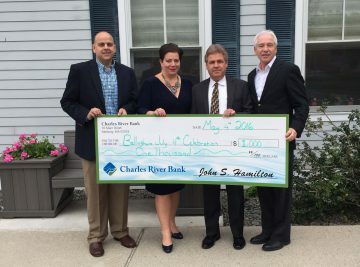 The donation was a result of one of Charles River Bank’s 100th Anniversary Celebration programs, where the bank hung 100 wind chimes throughout the towns where its branches are located – Medway, Bellingham, and Mendon. The wind chimes were a free 100th Anniversary commemorative gift for each person who found one. The “Finders” were asked to post a picture and list the location of where their 100th Anniversary wind chimes was located and submit the information via CRB’s Facebook page or by e-mail. A donation of $25 per wind chime was made to each town’s library. In Bellingham, 33 wind chimes were placed both inside local businesses and outside in public areas. Charles River Bank is pleased to support the valuable programs offered through the Bellingham Public Library in this special Centennial Celebration community program. The Bellingham library is located at 100 Blackstone Street, Bellingham, MA.